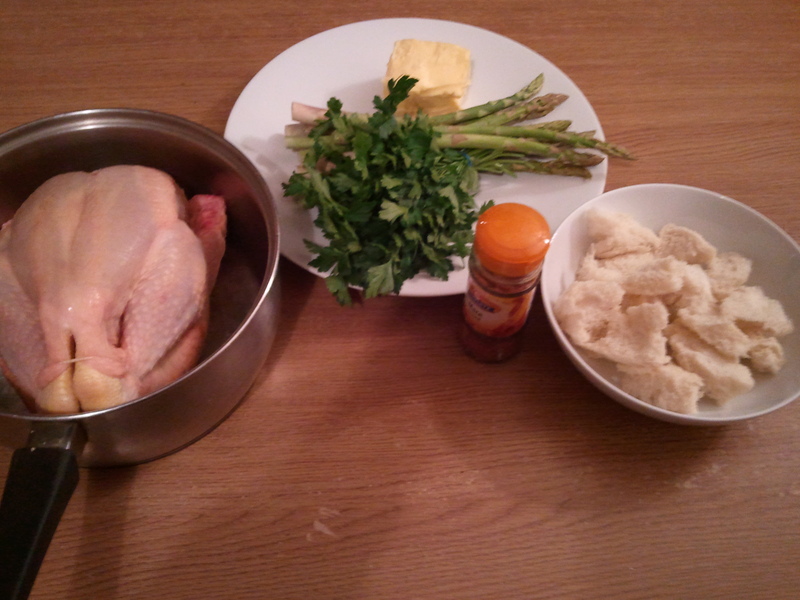 Here’s the recipe I used for my special Valentine’s Day chicken and asparagus. It’s from Hannah Woolley’s 1675 The Accomplish’d lady’s delight in preserving, physick, beautifying, and cookery. Boyl your Capon, or Chicken in fair water, and some salt, then put in their bellies a little Mace, chopped Parsley, and sweet Butter; being boyled, serve them on Sippets, and put a little of the Broath on them: Then have a bundle or two of Asparagus boyled, put in beaten butter, and serve it on your Capon, or Chicken. A capon, incidentally, is a castrated rooster. They are not readily available in the UK, but if you are particularly keen to try one there are some places online you can find them, such as here: http://www.keevilandkeevil.co.uk/christmas/free-range-corn-fed-capon/. According to that website, it is actually illegal to produce them in this country. I never knew that – you learn something new every day! Not having access to a capon, I started with a small chicken (free-range and corn-fed). The recipe is a little confusing with regard to when you stuff the chickens, I opted to do this before cooking. I mixed 3 heaped teaspoons of butter with a teaspoon of mace and a chopped bunch of parsley. I then put this into the cavity of the chicken. The chicken was trussed with a piece of elastic, so I just took this off and then put it back when I was done stuffing it. I then put the chicken in my largest saucepan. It was a bit of a tight fit and the lid only just squeezed on. I added as much cold water as possible and a few grinds of the salt mill. Then I put the lid on and brought the pan to the boil. Once it boiled, I turned it down to a low simmer and I let the chicken cook for an hour, periodically turning the chicken over as it came of the water at the top a little. 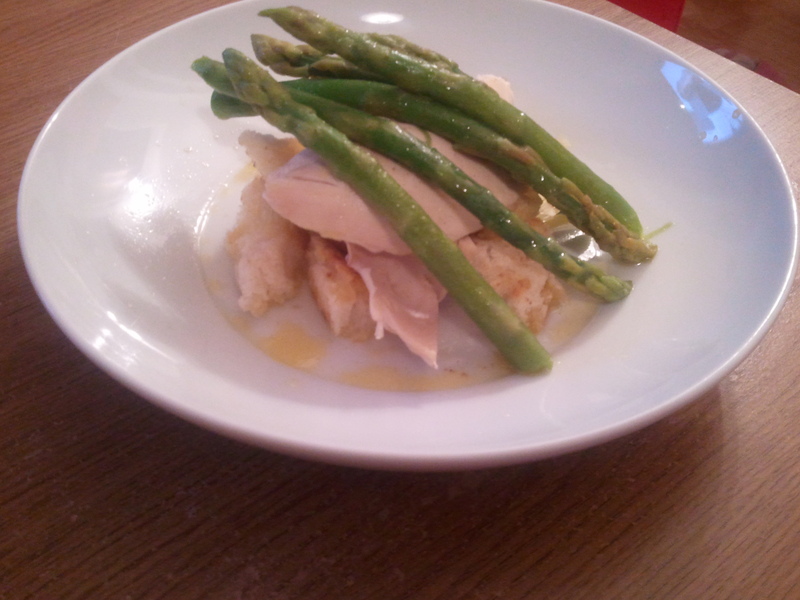 Once the chicken was almost ready it was time to make the sippets and cook the asparagus. Sippets are similar to croutons, but they are fried in butter rather than baked as croutons usually are. The asparagus just needed blanching for 5 minutes in a pan of boiling water, then after draining I added a knob of butter to the pan and left it to melt (off the heat). I then melted even more butter (it’s a pretty butter heavy dish as you might have gathered), a couple of teaspoons worth, in a frying pan. I tore up 2 large thick slices of day old bread (actually same-day bread that had been left out for a few hours) and fried them for a few minutes on each side in the butter. I put the sippets at the bottom of a large shallow bowl (a pasta bowl), then sliced off a chicken breast and laid that on top. 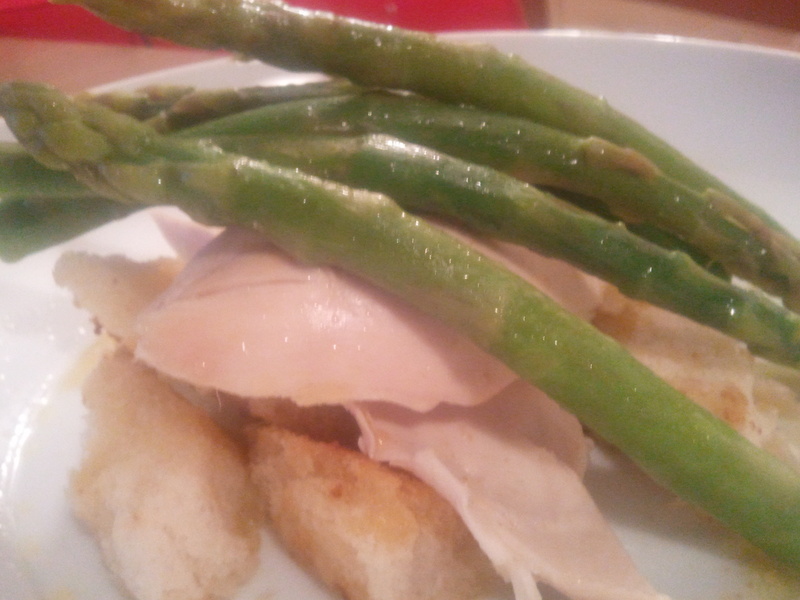 I took about two tablespoons of the cooking liquid and drizzled this over the top, then finished with the asparagus. I would certainly recommend cooking this, it was very tasty indeed. 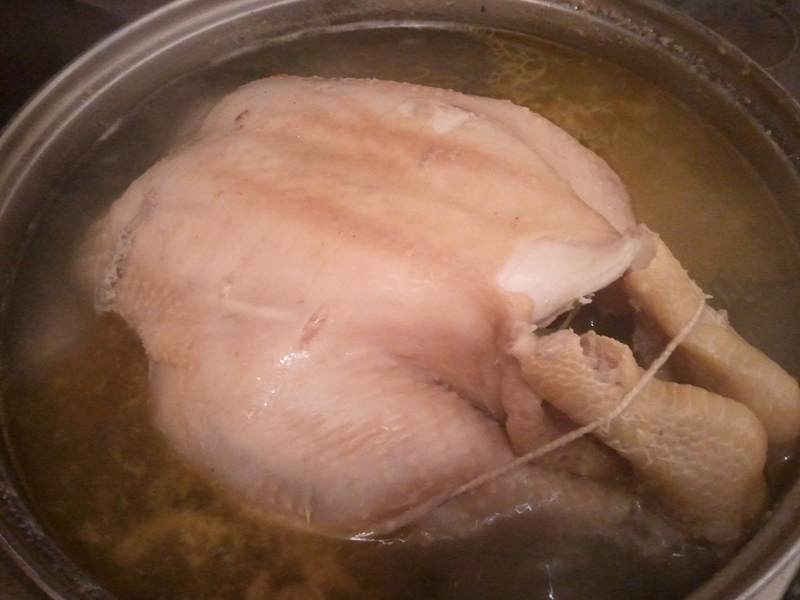 The boiled chicken, which was really poached as it was cooked on a lower heat, was very tender and full of flavour. If you fancy cooking up this for Valentine’s Day or otherwise, you can find the recipe below. The will serve two people generously with leftovers if you have a small chicken. For a more filling meal, I’d suggest cooking some potatoes and carrots with the chicken. 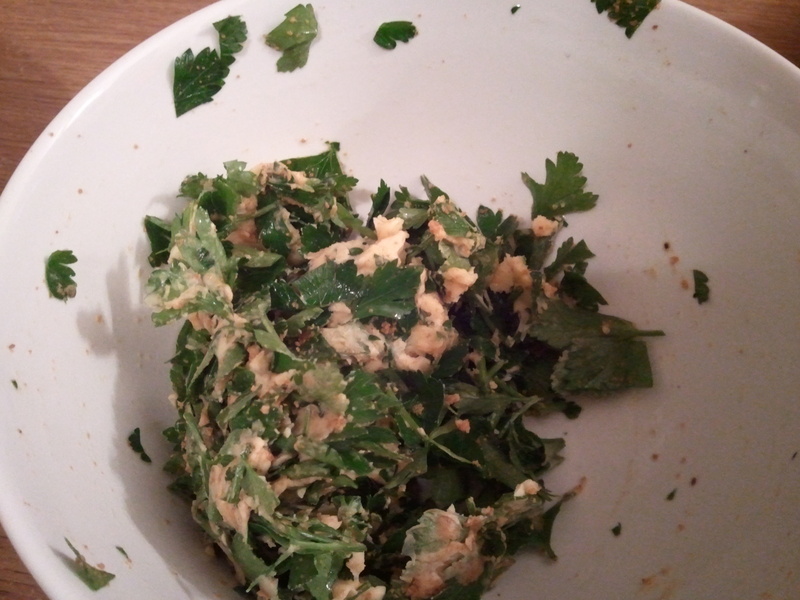 Chop the parsley into small pieces and mix with the mace and just under half the butter. Put this butter mixture into the chicken cavity, then put the chicken into a large saucepan. Add a pinch of salt and fill the saucepan with cold water until the chicken is just covered. Cook uncovered until the water comes to the boil, then turn down the heat and put the lid on. Cook for another 50 minutes or so, remove from the saucepan to check that the juices are running clear. If not, return to the pot until ready. When the chicken is ready, remove from the pan at put on a carving board. 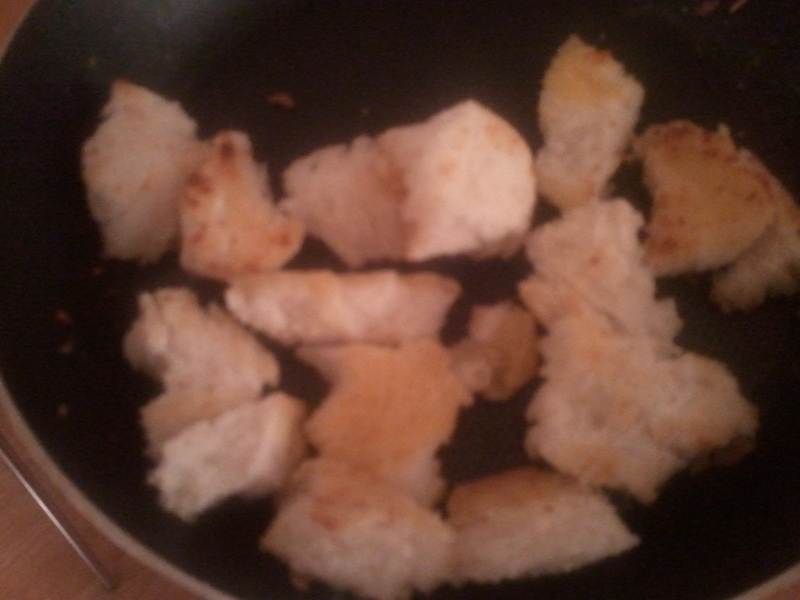 Melt half of the remaining butter in a frying pan and fry the bread for a few minutes on either side until it starts to brown. Meanwhile, bring another pan of water to the boil and blanch the asparagus for 5 minutes or until tender. Drain, then return to the pan with the remaining butter, leave off the heat with a lid on so that the butter melts and coats the asparagus. Carve the chicken, removing the skin. Divide the sippets (the bread) between two wide, shallow bowls or plates, then top with some of the carved chicken. Put half the asparagus on top of each, then drizzle over a few tablespoons of the buttery cooking liquid from the chicken.